Our Easter holidays started well with gorgeous weather and a weekend spent in the fresh air. On Sunday morning we went on one of our favourite walks, packing a picnic of coffee and biscuits for John and I, and hot chocolate and marshmallows for Bella and Angus. For Molly we packed: lead, muzzle, water, bowl for water, dog biscuits...it's a bit like trying to get out of the house with a baby. We walked for a couple of miles through the greenest countryside and I remember thinking - and telling John - how happy I was, how good it felt to be out in the sunshine when spring was at it most vivid, with the bluebells just coming up, and the promise of two weeks off work ahead of me. Rural England in the spring is a sight to behold and the light was so beautiful in the woods - I was really cross that I hadn't brought my big camera, so had to content myself with the one on my phone. The air was heavy with the smell of wild garlic and the birds were singing and the sun was really warm. We drank our little elevenses picnic in a quiet spot and it was just completely lovely. We came home and ate lunch outside, then spent all afternoon in the garden, working on some jobs, with the kids either on the trampoline or their bikes, and Molly mostly lolling on the grass. Dinner was chicken in a creme fraiche and tarragon sauce with the kitchen door open and the smell of cut grass in the air. And then, while John and I were in the kitchen clearing up, Molly bit Bella on the neck as Bella was stroking her and saying goodnight. We took Bella straight to A&E to have the wound cleaned and dressed, and she was prescribed some antibiotics just to be on the safe side. We returned home around 11pm Sunday night, dazed and confused, and once the kids were in bed had a conversation we never thought we'd have about returning Molly to the kennels we adopted her from. We both slept very little Sunday night and first thing Monday I phoned them. They were shocked - we were shocked! 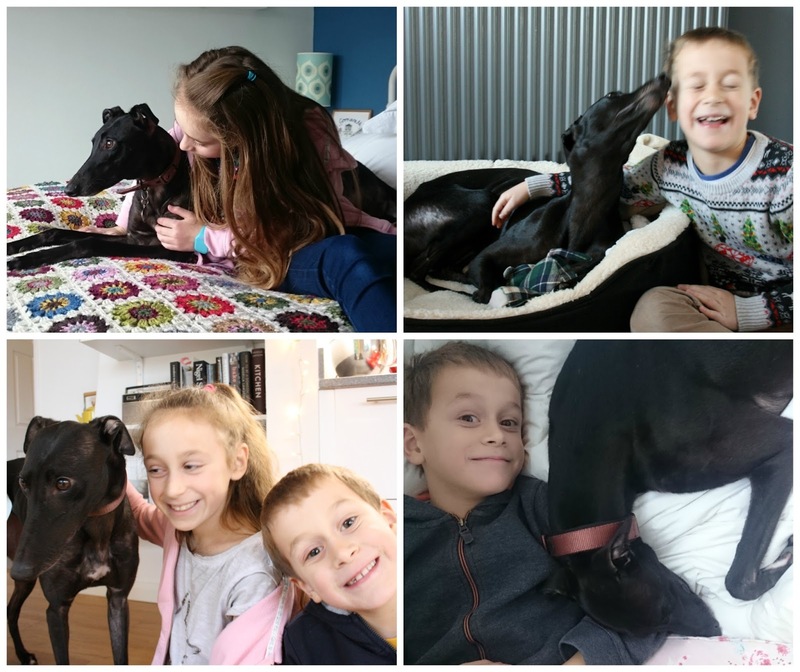 - as it's very unlike greyhounds to do anything like this as they are known to be a gentle breed, but said of course, you must bring her back. So, while my sister looked after Bella and Angus for the morning, John and I drove back to the kennels with a confused Molly in the boot. We had a long chat with the lovely people who work for the charity. They were mystified as to why it had happened but said she could be in pain, or irritable from the heat. We've always been very strict with the children on how to behave around dogs; don't pet a sleeping dog, always call them by name first, move away as soon as you hear the low "warning" growl, don't get in their personal space. But whatever the reason, John and I knew we could never take the chance that it might happen again, or that Molly might hurt a friend or family member's child. The charity assured us that Molly would be re-homed, perhaps with a family without children, or with older children, and we said goodbye to her. It completely broke me. I cried like a baby. John cried like a baby. We stood outside the kennels and just hugged each other, crying. We all really, really loved that dog. I feel teary now even writing this. Molly lived with us for only four months but it felt like a lot longer, and I think you all know what she meant to us. I loved my daily morning dog walks before work, loved watching the seasons unfold in the woods, and she was part of our family. We desperately miss her presence in the house, the clatter of her paws on the floor, the tinkle of her collar, the way she just had to hear the dishwasher open to appear, suddenly, and start trying to lick the plates. The way she would jump on our bed first thing in the morning to say hello, the way she'd lie oh-so-patiently by the dinner table, hoping for scraps. I always fed her my toast crusts. Silly things, little things, but things that made her part of our family. It was the right decision, but incredibly hard to make. Fortunately the wound on Bella's neck is healing very nicely and now just looks like a graze. She will have a scar, but it will be small and should fade with time. She's not remotely put off dogs, thank goodness. But yesterday was hideous. John and I cried a lot. The children seemed remarkably fine with it all, but then Angus woke up sobbing last night, saying how much he missed Molly, and Bella has been subdued all day today. It's sinking in. I've been keeping myself very, very busy, because it helps me. I'm smashing that Easter to-do list, let me tell you. Today was easier, and I spent a very therapeutic few hours in the garden this afternoon, working and thinking. We loved being dog owners. It suited us very well, and I like to think we were ok at it. But I don't think we can adopt another retired greyhound for the time being. Perhaps when the kids are older. But for anyone who it thinking of adopting one, please don't be put off by this; incidents like this are very rare and they are generally calm and loving dogs who make wonderful pets. I'm not put off, but I know that now is not the time. We are considering our options. We may get a puppy. To be honest, homing a retired greyhound - with the toilet training and obedience training - is a bit like getting a puppy, so I feel like we've got a much more realistic idea of what to expect now than we ever had before. And we'll all be OK. We are already more OK today than we were yesterday, and we'll be better still tomorrow. We have a lot to think about. But I am so happy, in a sad sort of way, that we got those four wonderful months with Molly, even though she barked at all other dogs, chewed the furniture, wee'd on every single carpet, stole food straight off our plates, and generally made herself known. We loved her very much. Oh Gillian, such a sad happening before Easter & your longed for break. My thoughts & feelings are with all of you. Hope all goes well for the rest of the holidays. Loved the bluebell photos, so between the sad story & the gorgeous photos I felt quite teary too. Maybe if you pop across to my blog, a little something may put a smile on your face. Take care all of you. I'm so sorry. You did the right thing, though I know it wasn't easy. Hugs to all of you, take care. So very sad, we had to give back a pet one time after a biting incident so I know what you're feeling. Better luck next time. Keep the good memories and let this one fade. This is sad to hear! Hope Bella is feeling better! Hope Molly finds another forever home,but you did the right thing. I'm so very sorry. What a hard thing to have to go through. I don't know what to say. You are not the kind of people that take such decisions lightly, and it was obviously very hard to decide. I still wonder whether Molly did not deserve a second chance. It has not happened before (the biting) and it may not ever happen again. But now it's too late, she's gone and you'll keep remembering her for her good and fun ways. You are right, rural England in spring is a sight to behold! I am still dreaming of catching the bluebells one year - so far, I have always been too late in the year, and one year I was too early. I'm so sorry Gillian. It must have been such a difficult decision to make, and even under the circumstances, not one you took lightly. Very sad for you all. It is still a shock for you as it came so suddenly and unexpectedly. I am sure she will be rehoused with a family with no children or perhaps a single person who needs that special loving that Molly has. So don't feel too sad for her or guilty. You made exactly the right decision and there will be another dog for you when you are ready. Such a terrible shock shock Gillian. I'm so sorry Bella got hurt and think you did the right thing. I'm sure Bella will heal well and any scars will fade in time. Try not to worry about Molly, she will be fine and you have done a great job teaching her how to be a family pet. Sending a virtual hug to you. Poor Molly! No second chance for her, abandoned once again. When I was a baby, my parents took a dog. Who bit me once on the head. Was told off. Never did it again, lived with us for 12 years. She hasn't been in any way abandoned and she will get a second chance, with another family. A bite in the neck is not to be taken lightly - especially with kids. I fully understand your decision - and also clearly feels through your post how difficult it was. Your love for Molly has been obvious from day one. I hope you all get to enjoy the rest of the Easter break! My heart breaks for you all, but you know you made the right decision for your family. You did the right thing. The dog had history and was always going to be a little unpredictable. Get that puppy and train it to be the dog you want it to be. Meanwhile, enjoy the Easter holidays. So sorry to hear this. Try rubbing some Bio Oil on Bella's neck. It is great for scars. What a heartbreaking decision to make, and I understand that you've had to make the best decision for your family. You're right in that it's very unusual for greyhounds to bite, they're normally very gentle, but they do something called 'nitting' when they try to grab you (usually by the hand) to make you stroke them or continue doing whatever it was they liked, I wonder if she tried to do that but caught Bella instead? Whatever happened, you've made the decision to return Molly based on your family, and that's completely understandable. On the plus side, Molly has shown that she can settle in a home and those few months with you will stand her in good stead when the kennel rehome her. Perhaps she needs to be in a home with older children. I'm so sorry it didn't work out, but you gave her a loving home with the best of intentions. I was crying reading this because she looks so much like our greyhound Alice, I'd be heartbroken if we couldn't keep her. Hi Gillian, Molly will get another chance. We are our rescue dogs 4th owners. He just needed to find us. Like others have said, the time she was with you has taught her to be a family pet and I think that is great. You cant take chances, you would all have been on edge all of the time and that can be picked up on by the dog. I wish for Molly her next family are a retired couple with a massive garden with lots of moss that she can tear out of the garden. What a terrible shame :-( so sorry for you all. I'm so sorry it turned out this way for you. You did your best. You might consider a Spaniel (Springer, Cocker, Field) for your next dog. They have such a gentle temperament. Don't give up; dogs add so much to our lives (as you have already found out) and I think every child needs a dog in their life. On a day when his life seemed too much, I would always find my son talking to our dog (who was such a great listener). A King Charles Cavalier Spaniel!! I am so sorry that this happened to you and your lovely family. It is sad and heartbreaking but you made a right decision, only sometimes the right decision is not the easy one. So sorry. Sometimes it doesn't work out, but you have to be safe. Hugs. Such a shame for all concerned. Could the reason have been sleep startle? I've heard this is common in greyhounds - but like you say, too risky with children. Such sad news for you all. I'm sure you did the right thing. Your post made me tear up and I'm not a dog person! What a difficult situation. I'm happy to know that you are feeling a bit better with each passing day. I'm so sorry to hear your sad news. We have two rescue dogs and have been very close to having to return them both at different times. I think if we had children we would have. They touch your lives in ways you never imagined and I can only imagine how upset you feel. It sounds like it was the best decision for your family and taking the time to decide about your next family member is a good idea. A puppy is hard work but worth it, Pickles our first dog we had from a puppy and she is our best friend. Sending you love and good wishes. This is so sad. I feel your pain. I'm sure that Millie will find a good home and hopefully, in time, you will try again and find another dog to welcome to your family. I am glad that Bella is healing ok (I have been reading backwards) after the unprovoked bite in her neck. I am also glad that she is not traumatised. I am heartbroken for all of you that you had to return a beloved family member to the rescue centre. It is for the best, you'd never quite feel comfortable around Mollie and she would pick up the vibe. She had four wonderful loving months with you, which is more than she ever experienced before. In time, a new family will be found for her, maybe one with older children, or no children. Our dog once bit a little boy in the arm, it was awful, although not unprovoked. I still worry about it. He is quite an anxious dog now although he wasn't as a puppy and we need to pay close attention to his signals. Jeez, you must be thinking I am a complete numpty. I am of course! I thought I read about Bella's wound healing well in you're newer post, hence the note in brackets above. Must not start reading blog post when I should be going to bed! How very sad for you. I do think that you made the only choice you could with your children. We have a young dog and primary school school children. We have always clear that the dog would not be able to stay with us if he bit the kids regardless of how much we care for him and we do care for him a lot. I am sure all the work you put in with Molly will not be wasted.